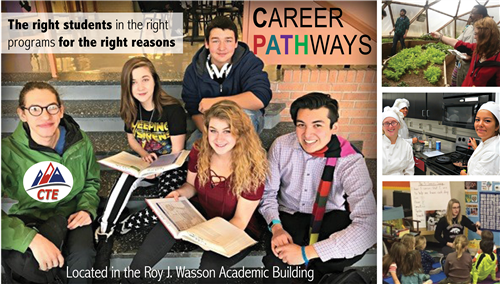 The Career Pathways Program is a D11 Career & Technical Education program at Odyssey ECCO located on the Roy J. Wasson Academic Campus. We offer a series of articulated educational and training programs and services that enable students, often while they are working, to advance over time to successively higher levels of education and employment in a given industry or occupational sector. Each step on a career pathway is designed explicitly to prepare students to progress to the next level of employment and education. We offer free transportation from all D-11 High Schools. Our articulation agreements with Pikes Peak Community College, the University of Colorado at Colorado Springs, the University of Colorado at Denver, and Metro State University, allow Career Pathways students to potentially earn college credits.